YAY a paperback giveaway from yours truly!! I am giving away two yes TWO copies of Katie McGarry's "Pushing the Limits" in honor of Candace's Book Blog, Dazzling Reads, Page Turners, The Book Swarm, and Bewitched Bookworms Pushing The Limits By Katie McGarry Read-A-Long. The read-a-long is six weeks long, July 24th till August 28th. Since I haven't read this yet I really want to participate, because I have never participated in a read-a-long and they really sound like fun. 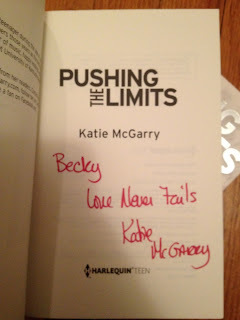 Since I went to BEA this year, which is where I got my signed copy, I also grabbed two extra copies as giveaways. Since the read-a-long is coming up and I don't even think the novel is out yet I wanted to give my BEA copies away now so that two more people can join in the read-a-long fun! I obviously cannot force you to participate in the read-a-long, but I do highly encourage that you respect why I am giving it away in the first place and if you win a copy then please try and make time for the read-a-long, because it will be fun! Now, there are two things about these giveaway copies. One is signed, one is not. The signed one, though, is signed to me by accident. What happened was my mom saw an open autographing booth, thought the book looked like something I would read and went ahead and got an autographed copy for me not knowing I already got one. Both are brand new, never been read. The plan is for the giveaway to end on Wednesday, for the winners to respond to their winners emails, and for me to then go to the post office the next day that way they will get them in time for the read-a-long. SO PAY ATTENTION TO THE BLOG, YOUR EMAIL, AND TWITTER ON WEDNESDAY!! -If you win only I will have access to your mailing and email address and will only use it for shipping and contact purposes. I've read some really good reviews about this book! Looking forward to reading it! =) Thanks for the giveaway! I would try to do a read-a-long, but those are hard for me, as I start to read, and don't stop till done, it its where we have to read slow, and wait for others, then it wont be for me. I am glad your into them. Have fun with it. I would participate in discussions and such for sure. Just the reading together things is not for me. Great giveaway. So have I! That is why I am so excited to read it, because I haven't seen a bad one. You are very welcome and Good Luck!! Yea, I don't know if Ill have the same trouble since I haven't done one before for the same reason. Plus time constraints, but I am finally willing to try one so we will see lol. Great! This sounds exciting! I am glad you thought of these kind of activities. The giveaways are awesome. Thanks for sharing this with us. I am looking forward to your next posts. I have been hearing alot about this book...really excited!!! Thanks for this giveaway!!!! I'm really excited for this book. I can't wait to get my hands on it! I really like the comment on the signature! Love never fails! I have entered so many contests to win this book but other lucky people got it no fair!! *huffs* I really want to read this book!!! I've heard about this book and really really wan't to read it so bad. I love the signature also. Super cool. 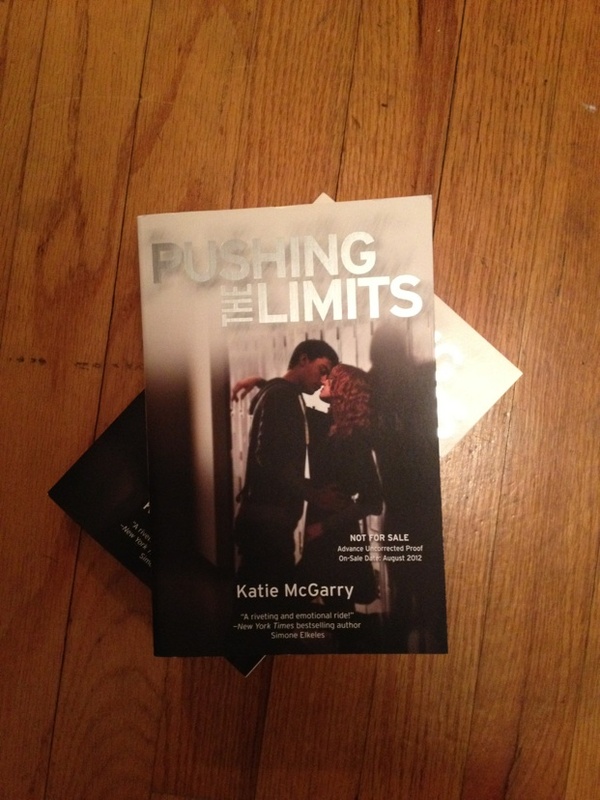 So excited for Pushing the Limits! I heard nothing but great things! Thank you for giving us a chance to win! I want to read this book SOOOOO bad! Thanks for the giveaway! I really am looking forward to reading this book. I LOVED this book. Can't wait to own it! I've never done a read-a-long before and it seems fun...I must check it out! This book sounds great. And thanks for the giveaway! Same here! I haven't heard anything bad about it yet (knock on wood). You are very welcome and GOOD LUCK!! Same here. They sound so fun but I never had the time to participate, but this one sounds super easy and with them picking such a great book I couldn't refuse! You're welcome and GOOD LUCK! !